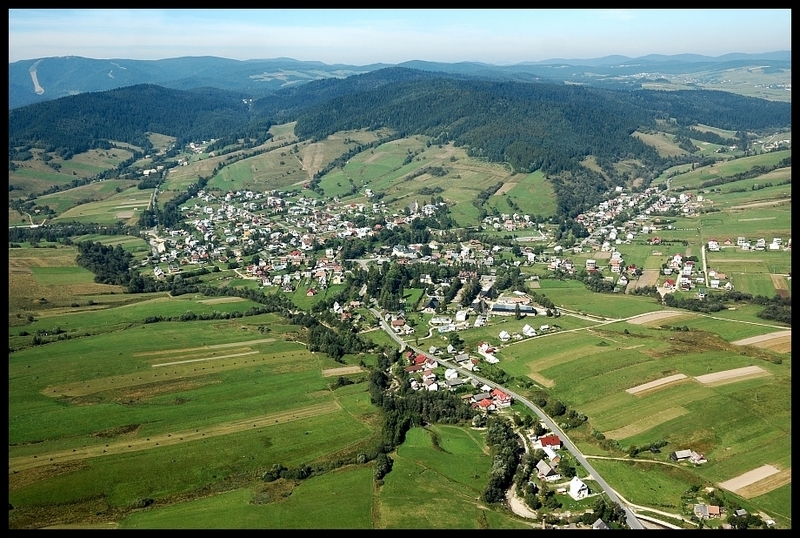 Tylicz is an old country town situated 600m above the sea level and placed at the confluence of two streams Muszynka and Mochnaczka 6 km east from Krynica. Main road goes through the town and later it cross the Pass of Tylicz leading to Slovakia (to the frontier crossing Muszynka – Kurov). That route used to be an old Hungarian commercial route. Natural qualities for the development of Tylicz are rich deposits of balneology. It is estimated that Tylicz is very rich in mineral water resources ( at least 22 cubic metres per day). There is also a bottling plant of mineral water, which has been operating here more than a dozen years. On the left riverside of Muszynka, below the historic Greek Catholic church there is a park with sheltered well of highly carbonated mineral water with high calcium and iron content, valued very much not only by inhabitants but tourists as well. It is very easy to find an accommodation in Tylicz, and also most of the local farms are well adapted for tourists’ lodgings. Tylicz has several ski lifts, and rental shops with equipment for Nordic Walking, various sorts of ski and bikes. There are also many picturesque routes for horse riders, bikers and walkers going through the town and the area. Through Tylicz leadss also a tourist track across the top of Huzary mountain in Krynica’s direction. One of the big attraction is “Lama” farm which organizes horse rides, sleigh ride, highlander’s fires and many more regional attractions. In Tylicz begins also the educational path “Na Rakowsku” which leads through Bradowiec to Muszynka’s gorge. In the oldest historical documents Tylicz was named differently. First as Ornamentum (ornament) or Oppidum Novum or as Ornawa-the last name is mentioned in thirteenth century document. Thanks to rapidly developing intensive exchange of goods between Poland and Hungary here at the meeting point of two streams Muszynka and Mochnaczka, the settlement slowly grew in importance. Polish king Casimir III the Great, granted the settlement with municipal rights in 1363. The king wanted to s,trengthen the expansion of settlements on the South of Poland. It was then that the old name Orawa was changed for Miastko. The king founded here at his own expense a church, parochial school and hospital, which doings were very characteristic of him according to the old say: “When king Casimir the Great came the Poland was wooden, when he pass away the Poland was brick and stone”. The king built also solid walls and by special law forced all passing merchants to store and sell here part of their goods( the store law). Soon afterwards the young town was granted with separate judicature (earlier Tylicz was subject to Muszyna). To this very day the mountain on the south side of the city is called “Szubienica” (gallows) because it was a place of execution and it’s sides are called “Łaski” (graces). Toward the end of fifteenth century the king Wladyslaw Jagiello gave Miastko and Muszyna with surrounding villages to Jan Radlica the bishop of Cracow and that is how Tylicz became part of the vast properties belonging to the bishops of Cracow (Those properties used to spread from the Łomnica and the Poprad on the west, to the sources of the Kamienica and Biała rivers on the east; and from the Hungarian border on the south to the Jaworzyna Krynicka on the north) until the First Partition of Poland in 1772 when these parts were taken by Austria. In the second half of the fifteenth century the town was devastated and destroyed by numerous fires and raids. It was Bishop Piotr Tylicki who renovated the town and gave it his own coat of arms and numerous privileges. He also founded parochial school and a church where he placed many precious works of art from his private collection. Grateful inhabitants changed the name of the town for Tylicz in honour of their benefactor. The bishop planned the town centre very carefully in order to avoid complete destruction in case of fire. He planned also a new Town Hall in the main market. During his time four big markets gathering were established: on 6th of January ( The Epiphany day) on a day in Easter’s Octave, on29th June (Peter and Paul’s feast) and 1st November (All Saints). There were also usual weekly market days on Thursdays. In 1683 Criminal court with the sword’s law ( The court was given authority to put the accused person to death) was established. Many infamous highwaymen were executed here as well as women accused of witchcraft. Constant growth of the town was suddenly stopped near the end of seventeenth century due to Swede’s raid ( Svedish Delusion 1655-1660) and big outbreak of cholera. The ethnic element of these area was heavily influenced by the constant migration of highlanders from the Carpathian Rus. They settled among Poles and Slovaks. They quickly adapted to the climate and introduced here their culture which combined farming and raising sheep and goats on the mountain slopes. Those people called themselves: Lemko and clearly distinguished their language, religion, habits and customs from that of others ethnic groups. They didn’t mixed easily with Poles and Slovaks, by their language they were closer to the adjacent ethnic groups of Boykos and Dolinians who lived near the San river. In seventeenth century the peace of the area was disturbed by religious controversies which never happened before. Opponents of the religious union between Catholic Church and Orthodox Church (which took place in Poland in 1596 in Brześć Litewski and gave origin to so- called Greek Catholic Church) were trying to force people not to accept union and choose Orthodox church. The rest of the local population didn’t like such politics at all. In consequence of all those quarrels parochial church of Greek Catholic confession was given to Catholic parish. The opponents of the Union were expelled from the town and the government in the town was divided in equal parts between Poles and Lemkos. During those disturbances parochial school in Tylicz came to ruin and wasn’t reactivated until 1758. In 1769 another important event took place. Polish gentry formed so –called confederation against Russian interference in Polish government. Some of Confederates came to Tylicz to organize fight against invaders (which were united troops of Russia, Prussia and Austria).Confederates built several earthworks and entrenchment in the area and set their camp close to Muszynka. The last battle took place on the side of Czerteż mountain. The Confederates lost, but they are still remembered here. There is a monument of Kazimierz Pulaski – chef commander of the Confederates, and in Muszynka you can still visit the remains of their camp known as “Obóz Koronny”. During the nineteenth century Tylicz slowly came to decline, mostly because of the new railway line which omitted the town on it’s route to Krynica. Before the WWII in Tylicz were several small factories like 4 mills, 3 sawmills, 2 oil mills and brickyard, 19 shops in the market and a slaughterhouse. Tylicz was multicultural by then. There were not only Poles and Lemkos, but also Romany and Jews who had here their own cemetery (not existing today). During the WWII Tylicz played significant role in Polish resistance movement. The Nazi took the town seven days after they attacked Poland. They treated Lemkos better than Poles, which resulted in mistrust among inhabitants. Some of Lemkos hoped that they would be able to create their own state and they acted with hostility towards Poles, but there were also Lemkos who remained loyal and they helped many people to flee from the Gestapo. Nowadays Tylicz and the surrounding villages Muszynka, Mochnaczka, Czyrna, Piorunka, Berest and Polany are submit to the Krynica’s municypal government. The church of SS. Peter and Paul founded by Bp. Piotr Tylicki and built in 1612. Entirely wooden and boarded, with sheet metal roof. It consist of one narrow nave and presbytery in triangular shape, next to which the vestry is attached. The tower was attached in 1936 over the old vestibule. The main altar is in Rococo style (second half of eighteenth century) with Madonna of Tylicz with Child, painted by Adrian Ysenbrandt. There are also five more altars with historic paintings: S. Anne (seventeenth c.), Veraicon ( seventeenth c.), S. Martin ( unknown artist probably from seventeenth c.), S John Nepomucen (first half of eighteenth c.), and contemporary – Jesus’s Heart by Czeslaw Lenczewski (1950). A baptismal font and the organ are made in Baroque style. There are also paintings from eighteenth century: The death of S. Joseph, Three Maries at Christ’s tomb, S. Anthony with Child, S. Tekla and S. Barbara, the latter as a patroness of artillerymen was probably given to the church by Kazimierz Pulaski himself. The oldest in the church is a Crucifix from fourteenth century carved in one piece of wood (probably from private collection of bishop Tylicki). 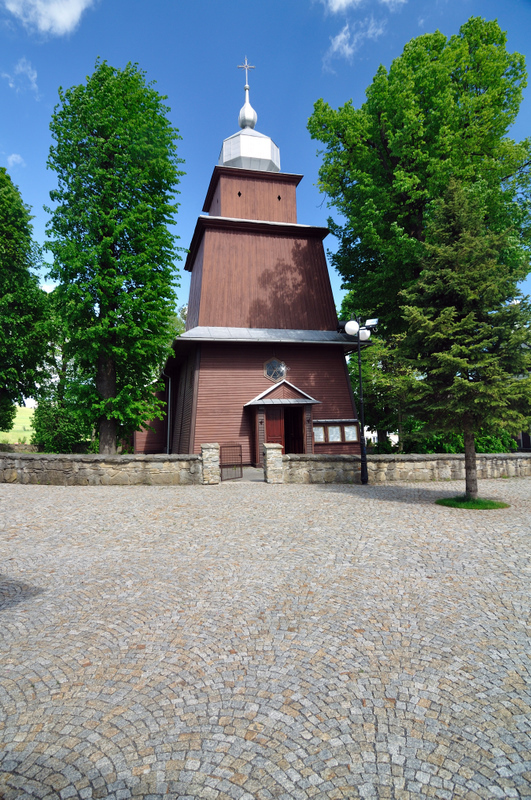 In front of the church there is a bell tower built in 1806 which bears the coat of arms of Tylicz. There are three bells. The eldest one was made in 1605 by Michal Urlich, the remaining two were made in 1960. In the churchyard grow a monument of nature-a several- hundred- year- old linden tree with it’s exposed roots of 5-metre circumference. Another, smaller cemetery is situated at the junction point of roads from Powroźnik. The place is covered with bushes so it is difficult to estimate how many graves used to be here. Nowadays only 30 up to 40 tombs are visible but it is only a small part of what is hidden by a abundant plants. Most of the graves dates from WWI and WWII. A lot of inscriptions is in Lemko language. There is old stone figure of Suffering Jesus in the crown of thorns, partly destroyed by time. There is also a grave of young pilot from WWII. Not far from Tylicz you can see a common grave of people who died of cholera. The plague came to Tylicz before WWI and annihilated two thirds of the population of the town. 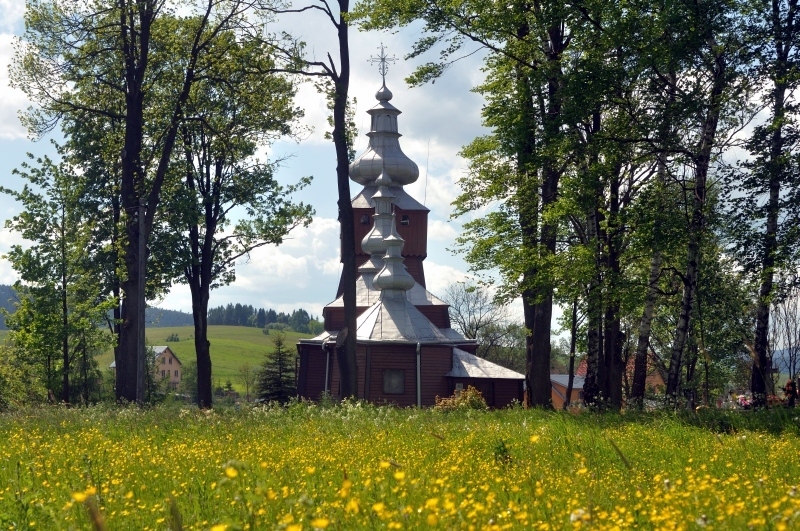 It is situated on the meadow below Łan mountain marked with a large wooden cross. Market Square in quadrangular shape with perpendicular streets - is a reminder of former Tylicz glory - all the market gatherings were held here and in the Town hall the Criminal Court used to preside ( nowadays a Rural House of Culture stands here). Not long ago you could still observe eaves of houses in the form of arcades characteristic for this type of architecture, but unfortunately they do not exist here any more. From centuries the surface of the market square was paved with so-called “cobblestones”. In the park near the church stands small brick shrine from 1808. Mineral waters – highly carbonated waters with high calcium were known here several hundred years before but not until they were investigated and described by L. Zejszner, their full potency was realized. In the 90 s of twentieth century A special mine area ”Tylicz” was created here and “Multico” company obtained a concession to exploit local mineral water in world wide scale. All sources and wells of local mineral waters as well as symptoms of exhalation of CO2 concentrates in the area on the left bank of Muszynka, Bradowiec and Syhowny streams. Only one source is permanently adapted to wider usage. It is the well on left riverbanks of Muszynka, down below historic Greek Catholic church in the park. It is the source already mentioned of highly carbonated mineral water with high calcium and iron content very much valued by inhabitants. There are several more temporarily adjusted for tourist ( for example two sources can be found on the educational path “Na Rakowsku”). Educational path of nature” Na Rakowsku” It is one of the first initiative of the whole program which aims to protect and use better the specific microclimate of forest around Krynica. The local government and the management of the forest want to protect it’s unique environment as well as use it more productively and create high standard conditions for tourists who would like to see the forest in it’s natural beauty. Another aim is to promote ecology. The path leads through southern side of “Bradowiec” mountain to it’s peak. It starts next to the small spring situated about 2 km from market place in Powroźnik direction( next to “Multi Vita” factory). There is a board with all sorts of information about the path, the map with places of all interesting objects marked by Arabic letters on it. The path is easy to follow. For anyone interested there are brochures and folder available in local libraries or at the forestry. Tylicz - Szwarcowa - Huzary (863 m above sea level) – Pulaski’s Mound. Total time:2 hours for going there and 1h40 minutes for come back. The route starts at the end of bp Tylicki’s street. It leads onto country road in north direction, at places quite steeple up the hill. 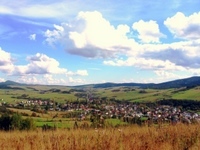 After reaching the first peak we can observe a beautiful panorama of Tylicz, Muszynka, Tylicz Pass and Lackowa mountain. We can also notice the mountains in Slovakia on the horizon. Later the route leads through the forest, at the beginning quite easy, but closer to the top of Huzary mountain it is more steeple at places. After passing the Peak of Huzary we enter the yellow track from Jakubik Mountain and it leads us down in bends to asphalt road and the Pułaski’s Mound next to it. From this place we can go to the centre of the Krynica or follow the yellow signs to the Parkowa Mountain. Tylicz-Szalone- Bradowiec- Rakowskie-Powroźnik- total time 3hours. The track goes across the peaks which surround the town from the west. 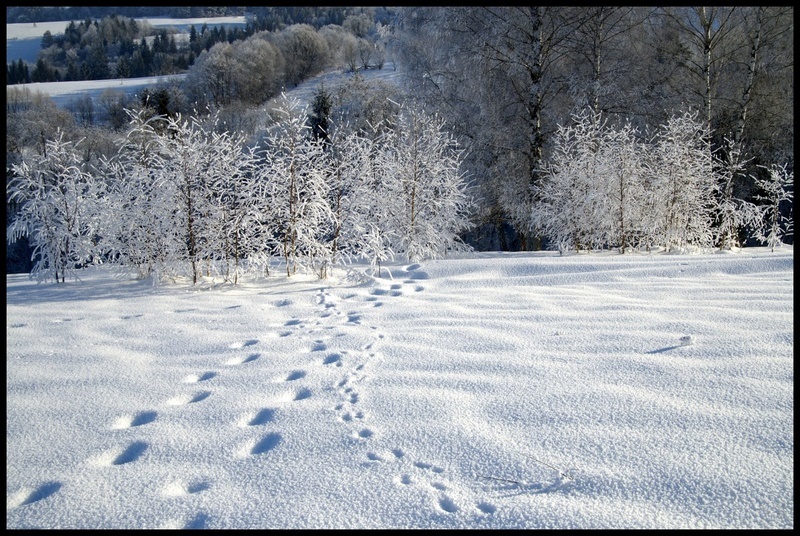 It starts in the Krynica Centre or at the Parkowa Mountain. It goes mostly trough the forest and peaks about 800m high. Near Bradowiec where the woods aren’t so thick we can admire the view with Greek Catholic church and numerous ski lifts near Tylicz. The track ends in Powroźnik at the bus station. Muszynka- Kamienny Horb (827m)- Wojkowa- total time3 hours. The track starts in the village south –east from Tylicz. At first it leads up the hill across the pastures then through the woods which are the historic reserve “The Trenches of Confederates of Bar” then along the Poland border. On the way there are several places where you can observe beautiful panorama of the Slovak Mountains. The route ends in Wojkowa village, 8 km away from Krynica. 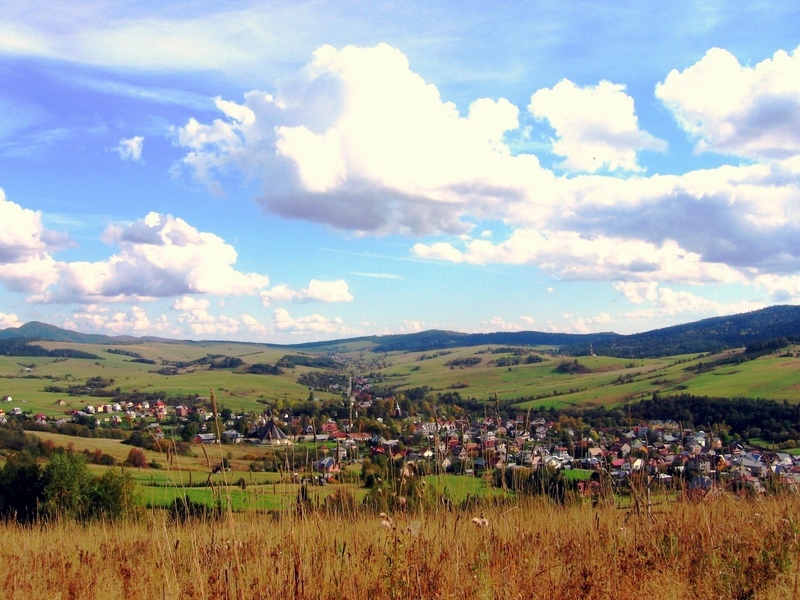 Muszynka is a former Lemko village, situated at an altitude of 650 meters above the valley of the same name, located just 2 miles from the Tylicz Pass. It was established in 1356, by King Casimir III, the Great. In fourteenth and fifteenth centuries it played a very important role due to it’s location at the busy trade route because it was situated on the way to Hungary. After WWII 70 % of Lemkos were moved by force to The Soviet Union. In the middle of the village stands Greek Catholic church of old under the name of S. John, the Evangelist. 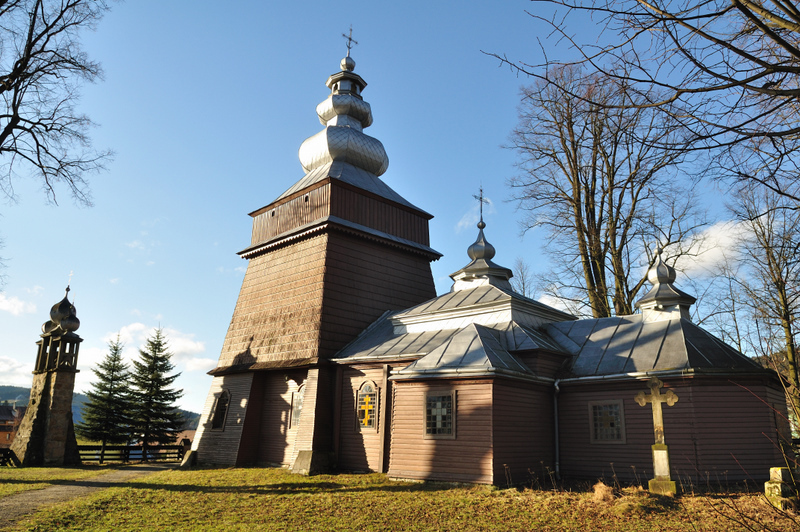 It is wooden, built in Orthodox style in 1689 it’s roof covered with metal sheet. Inside in one of the altars there is a picture of S. Barbara which was brought here from the Confederates’ Camp. Iconostasis is connected with side doors and dates from eighteenth century. Until 1947 the church was a Lemko’s parochial church, but nowadays it is a filial church of Catholic parish in Tylicz. The historic reserve “The Trenches of Confederates of Bar” requires also some attention. It memorise the presence of the troops of Kazimierz Pułaski here in the end of eighteenth c. which resulted in Partition of Poland and lack of independence. The Confederates fought in those woods against enemy’s armies and lost. The yellow trail leads to the top of Jawor, past the obelisk commemorating the Confederates and further leads through high Berest to Wojkowa. The red track goes along the Poland’s frontier starting at the Tylicz Pass and leading in direction of Dzielec and Laskowa peaks.